ANNAPOLIS, Md., Jan. 8, 2019 /PRNewswire/ -- Collins Aerospace is helping Norwegian passengers experience free and premium Wi-Fi onboard Boeing 787-9 Dreamliner and 737 MAX long-haul flights with its CabinConnect™ high speed, broadband connectivity solution. 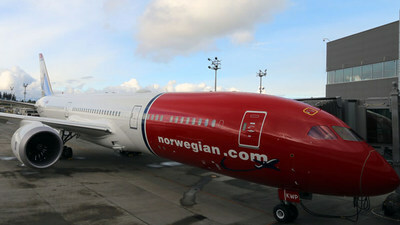 The new service, which will debut on the majority of Norwegian's transatlantic flights, enables passengers to stream video and music content, browse the web, access social media, voice and messaging services over the Inmarsat Global Xpress (GX) satellite network, the world's first and only globally available high-speed broadband network. "We're an innovative airline that's introducing brand new long-haul aircraft to our fleet as well as enhancing our global network to meet customer demand," said Boris Bubresko, vice president, Business Development for Norwegian. "Providing our passengers with the most reliable and robust in-flight Wi-Fi connectivity is very important to us. We're delighted to work with Collins which will support our long-haul connectivity needs as we continue to enhance the Norwegian passenger experience globally." This joint project is a critical part of Norwegian's vision to move to a fully connected aircraft fleet in the future. Beyond enhancing certain safety functions, using broadband connectivity for the flight deck will provide opportunities to deliver new cockpit services like electronic flight bag and real-time high definition weather to operators. Many of these services will require significant amounts of data to be exchanged between the aircraft and operations. "Our ability to address both Norwegian's cabin and flight deck requirements with a combination of industry-leading services and hardware provides the airline with a seamless solution," said LeAnn Ridgeway, vice president and general manager, Information Management Services for Collins Aerospace. "We are collaborating with Norwegian to achieve their vision of optimizing its aircraft and enterprise operations as well as integrating new capabilities going forward." "Inmarsat's GX satellite constellation allows airlines to offer inflight connectivity that is fast, reliable and consistent with coverage across the world," said Philip Balaam, president for Inmarsat Aviation. "Norwegian's passengers will have access to the highest quality of global, resilient and flexible broadband available in the skies. In the future, we are excited to provide even more value to Norwegian through the continued development of our global satellite network and related hardware." More than 50 percent of Norwegian's 787-9 Dreamliner fleet is expected to offer in-flight connectivity by 2020. Wi-Fi offering on the 737 MAX fleet will begin in mid-January. Norwegian is Europe's third largest low-cost airline and the fifth largest low-cost airline in the world. Founded in 1993, it's one of the world's leading airlines, operating around 500 routes to more than 150 destinations worldwide. In 2018, the airline carried more than 37 million passengers across Europe, the U.S and Asia. Norwegian operates a fleet of around 160 aircraft with an average age of 3.7 years, one of the "greenest" and most fuel-efficient fleets in the world. Norwegian was voted Skytrax 2018 Europe's Best Low-Cost carrier and World's Best Low-Cost Long-Haul airline. Norwegian is listed on the Oslo Stock Exchange and has around 11,000 employees based in Europe, Asia, the U.S. and South America. Collins Aerospace, a unit of United Technologies Corp. (NYSE: UTX), is a leader in technologically advanced and intelligent solutions for the global aerospace and defense industry. Created in 2018 by bringing together UTC Aerospace Systems and Rockwell Collins, Collins Aerospace has the capabilities, comprehensive portfolio and expertise to solve customers' toughest challenges and to meet the demands of a rapidly evolving global market. For more information, visit CollinsAerospace.com.